I have this thing for cowl necks. They are so easy to nurse in and feel so put together. In my world of mom fashion, they seem to go with everything from tights to skirts and everything in between. I was pretty excited when I saw that Kennis of Itch to Stitch was coming out with her own version of a cowl neck that is perfect for summer. Fabric: The Plitvice pattern requires fabric with at least a 75% horizontal stretch. The more vertical stretch the fabric has, the lower the cowl will drape. The first top I want to share with you is made out of a super soft blue slub knit from Simply by Ti. It can be found here. I have never purchased slub knit before and really was not sure what I was getting when I ordered it. I am so glad that I picked this fabric up. The slub knit has a great amount of drape and I love how it feels on this top. It is a lighter weight so you would not want to use it for pants or for anything too form fitting. I felt so comfortable wearing this fabric. I think it was 100 degrees out when I was taking these photos, and I kept pretty cool despite the heat. Pattern details: The Plitvice pattern has a center panel that is gathered around the bust to give lots of beautiful fabric folds over the bust and upper tummy area. The front panel is also a nice place to do some color blocking if you want to use a different fabric in the front. There are side panels on the front, and the back is one piece. The sleeves are cap sleeves that are integrated into the body like a dolman sleeve. The arms and bottom are finished with bands. From start to finish, the top took about 2 hours to complete. I love the texture in this fabric and how this pattern lets the drape show off in the most flattering of ways. My next top is in a green rayon spandex. 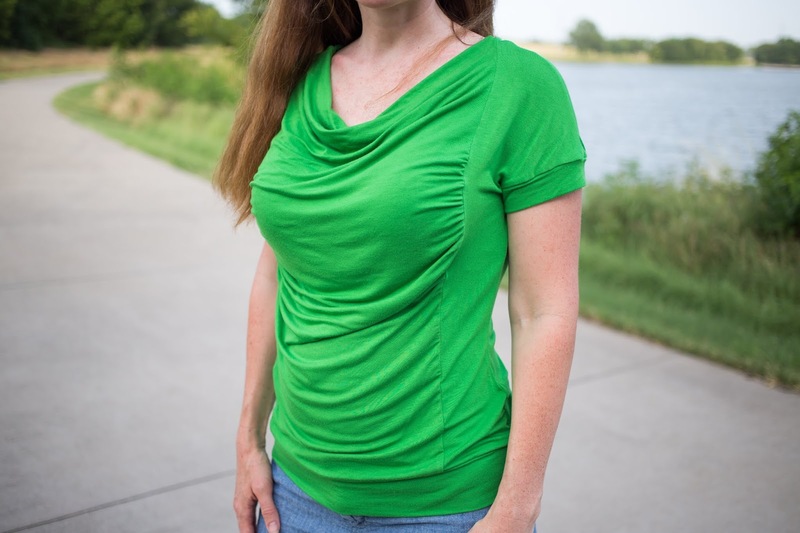 Rayon spandex is a wonderful fabric for this top as well. As you can see, this fabric has even more vertical stretch than the slub knit so the gathers cover even more of my tummy. I also think I need to add more green to my wardrobe. I mainly buy pink and blue, but green may just be growing on me. Sizing: I made a size 2 for my bust, 0 for my waist, and a 2 for my hips. The instructions will guide you through how to grade between sizes if all your measurements do not fit in one size. 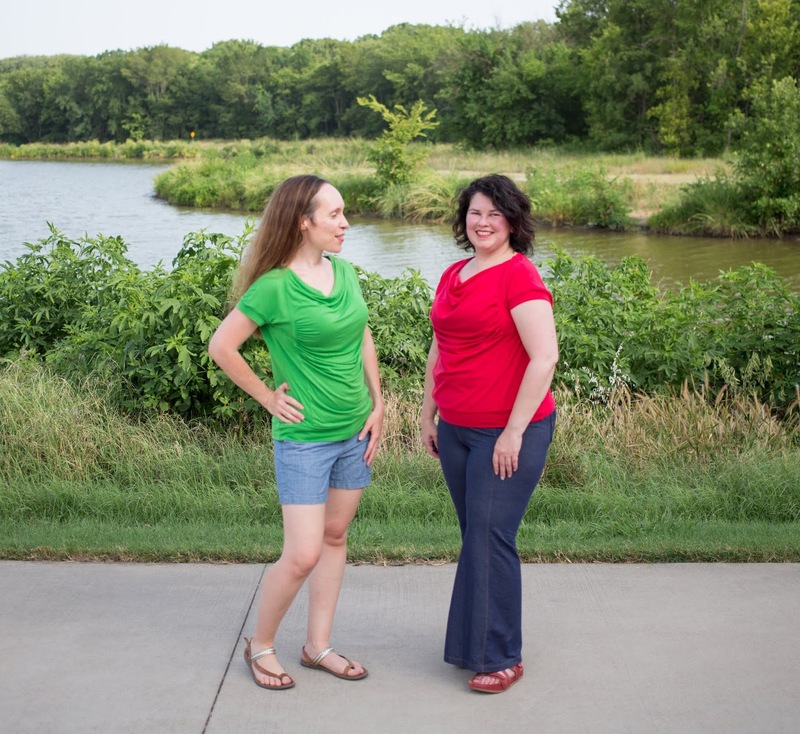 The pattern fits bust sizes 31 to 46, waist sizes 25 tp 40, and hip sizes 33 to 48. I did not make any adjustments to the pattern. 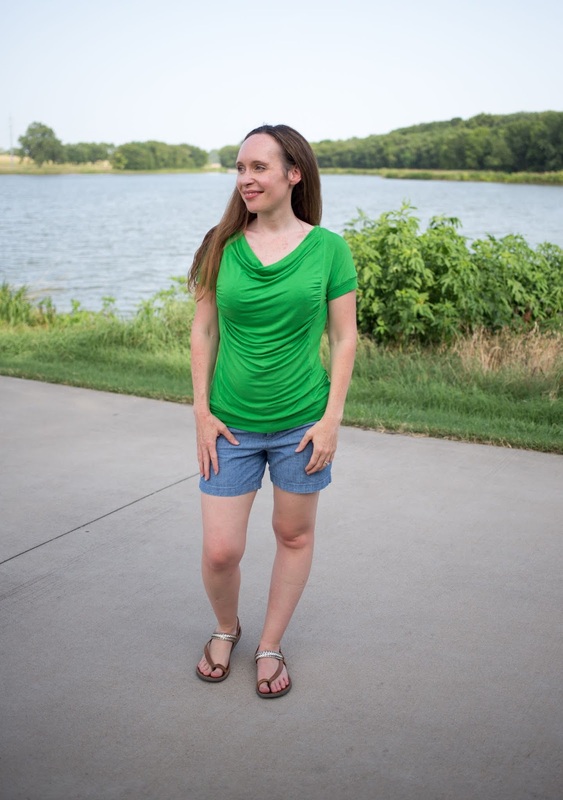 You can purchase the Plitvice Top PDF pattern here The release sale price for this pattern is now through Sunday, July 15th. Disclosures: I received this pattern for free as part of the testing process to give the designer feedback about the instructions and fit of the pattern. I received the slub knit for free (after paying shipping) from Simply by Ti. This post also may contain affiliate links, which means I receive a small compensation when you purchase via my link. There is no cost to you. Any and all opinions expressed are my own. 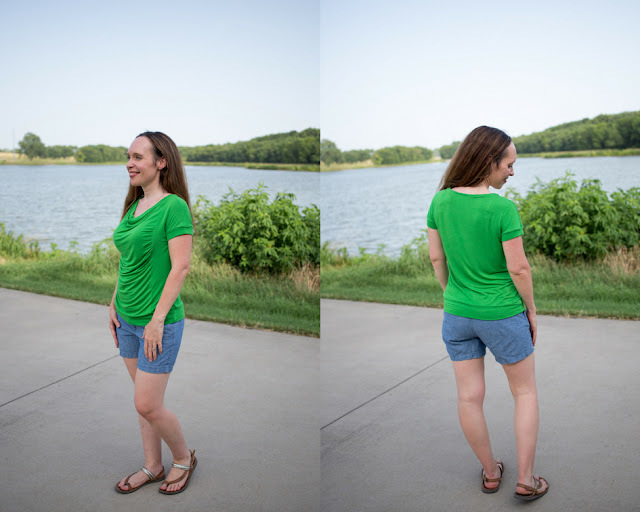 Photo Credit: my oldest daughter, Abigail, took the photos of my slub knit top, and my wonderful friend, Aimee Wilson, took the photos of the green rayon spandex top. We also got to test the same pattern and took photos together. Many of the photos of us together were blurry, though, which may be my fault because I was so excited to see my friend that I kept talking to her! Sorry Aimee. I will cooperate more next time! Green is definitely a great color on you. I will need to make an entire stack of these from the Rayon Spandex in the Simply By Ti shop! Thank you! I am surprised that I rarely buy it. 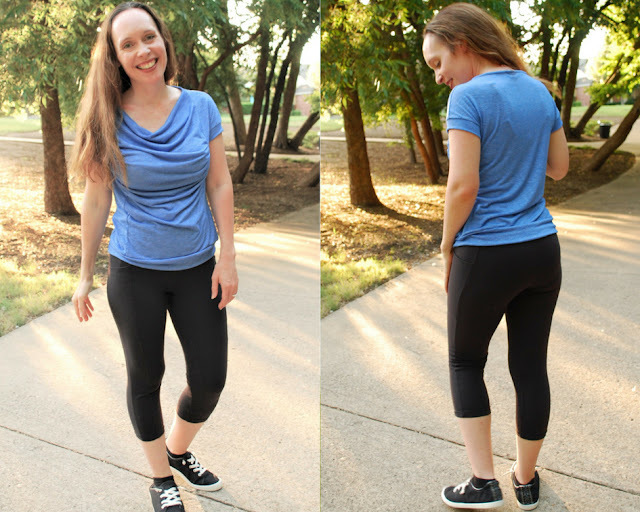 The Simply By Ti rayon spandex is going to be perfect for this top. You chose great colors for you Plitvice tops! Thank you, Crystal!! I am going to wear both of these a lot. Both look beautiful on you! My husband is the chatty one in photos- most family photos have his mouth open, because he is trying to tell us all what to do! Thank you! :) Haha! It is hard to be still and smile!